Vision Prep scholars are not only expected to build a foundation of academic achievement; they are also expected to demonstrate the strong charac ter “necessary to excel in middle school, thrive in high school and graduate from college”. 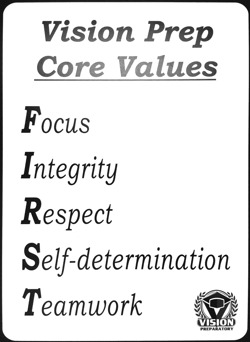 Because character education is a key part of our mission, we devote significant time to its instruction and we think critically about how best to align the school culture with our core values of Focus, Integrity, Respect, Self-determination, and Teamwork (FIRST). Learning how to focus and get something done is about more than just good grades — it’s the foundation for success in life. Mastering the skills of getting organized, staying focused, and seeing work through to the end will help scholars throughout life. Vision Prep will have systems in place (tight transitions, Life Work folder, STAR, Noise Meters, and others) to help scholars organize their work efforts and stay focused throughout the day, throughout the school. Children want to work in communities where competition is fair, integrity is respected, and cheating is punished. With proper guidance, young scholars can be given significant responsibility to help protect and promote the highest standards of academic integrity. To promote and teach these standards of integrity, Vision Prep will utilize consistently monitored systems (morning homework submission, calling home daily for incomplete or unsatisfactory homework assignments, teacher scanning during tests, assessment cover sheets, clear instructions, constant monitoring of visible compliance) to ensure adults in the building guide scholars toward good choices based on well-established standards. Staff members will also counsel and coach scholars through moral dilemmas, and hold students accountable for their decisions. Vision Prep staff members are, themselves, expected to be exemplary citizens who teach, model, and hold all scholars to high behavioral expectations 100% of the time. Respect between teacher and student is necessary for success in the classroom. Students want to be listened to and respected as human beings with wants, desires, fears, and emotions. The teacher must value the development of caring relationships as much as the teaching-learning process. Vision Prep teachers and staff members will strive each day and with each interaction to develop positive mutual respect between themselves, scholars (and their families). 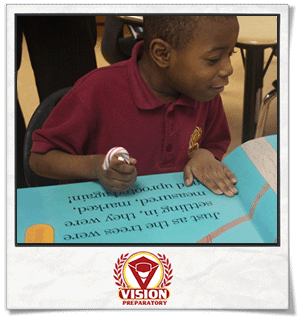 Vision Prep scholars will be encouraged to take the reins when it comes to their own learning. 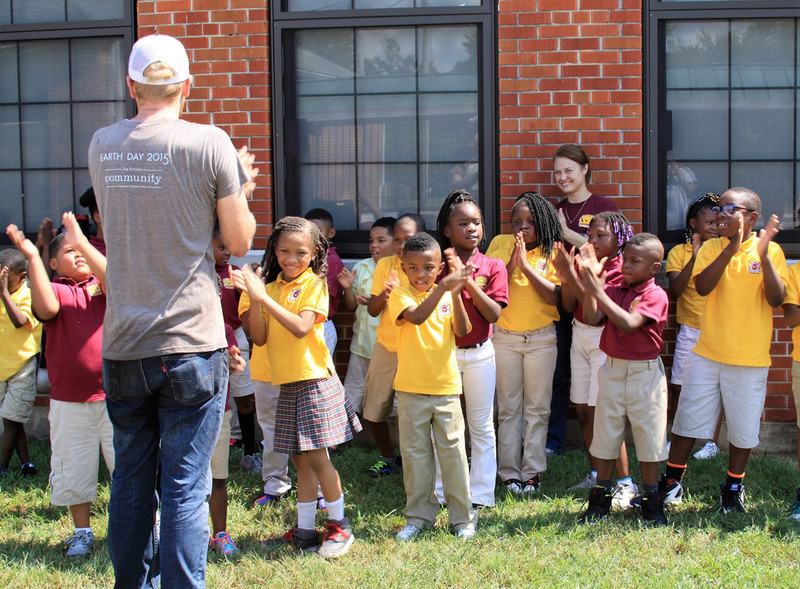 While our scholars will, from time to time, experience positive feedback in the form of Precise Praise for excellent academic work and Shout Outs for exhibiting high character standards, the goal will always be to help scholars become more and more intrinsically motivated as they progress from Kindergarten through 5th grade. Whether it is teachers working together to model positive behaviors or scholars collaborating in groups, an early foundation in teamwork skills helps children as they grow and develop into adults. Vision Prep teachers and scholars will be given daily opportunities to work and learn in pairs and larger groups. To guide scholars during these growth opportunities, teachers at every grade level will teach scholars explicit skills for working with their peers, Turn and Talk and Habits of Discussion, outlined in the student handbook.